Ballast not included. Recommended 750 lbs. The Storm is a portable goal designed for use in a fieldhouse, a gymnasium or multipurpose facility. Height adjusts easily from 10' to 6' via the Storm's Spring Assist design. To adjust, simply pull the pin located on the adjustment rod and raise or lower the rim as needed. Heavy foam padding in an array of colors are included to protect the base and front of the unit. The Storm is extremely stable and will not tip over when a guerilla hangs on the rim! Unit rolls easily on 8" non-marking casters that lock into position when unit is in use. 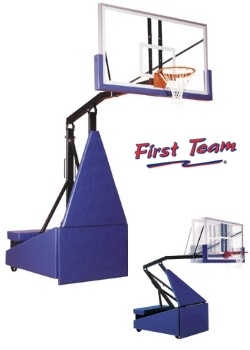 Backboards in several sizes are available as is optional backboard padding. BALLAST NOT INCLUDED: This system requires a recommended 720 lbs of ballast. Recommend solid concrete blocks from local home improvement center. 24 - 4"x8"x16" blocks or like combination. FREE lettering on padding with purchase of Hurricane, Storm, Thunder or Fury system! 1-color letters, maximum 10 letters, 3 font styles to choose from, 16 color options.